Chalmers Presbyterian Church on 2 Elizabeth Place, Timaru is unique in that it has an unusually large collection of stained glass windows for a Presbyterian Church. In May 2002 the church celebrated their centennial. This congregation was founded in March, 1902, when 170 members left Trinity Church for the purpose of accommodating part of the congregation to the north side of town. Services were at first held in the Theatre Royal, Stafford Street. At the end of 1902, the congregation arranged to build a handsome church on a site at the corner of Elizabeth and Banks Streets, at an estimated cost of £5000, including the price of a pipe organ. The church can hold 600 adults. The foundation stone was laid by the Rev. George Barclay on 14th May 1903. The building is faced with concrete and about cost 5,000 pounds to build. 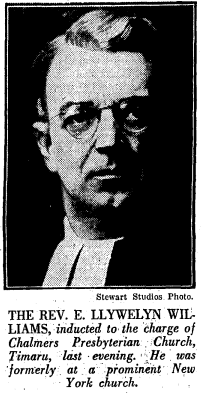 In 1903 the Rev. Robert Jackson, was the Minister in charge of Chalmers Congregation. 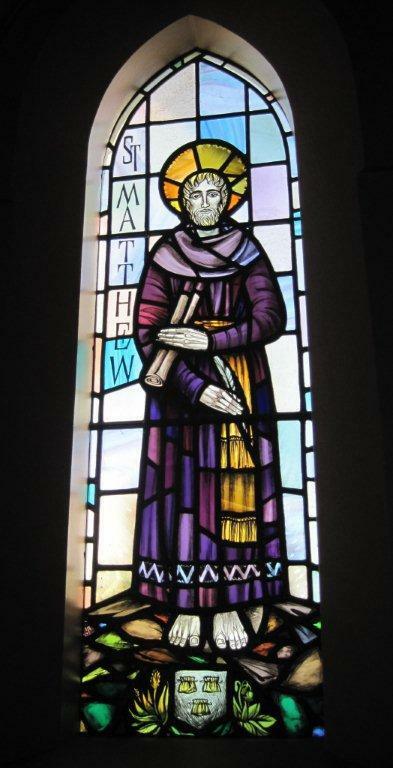 He was born in Aberdeenshire, Scotland and studied at the Edinburgh University, and was licensed to preach in Aberdeenshire. In 1883 Mr. Jackson arrived in Australia, where he had charge at Tumut, New South Wales, for five years, and was subsequently for a like period at Berry in the same colony. After a trip Home, in 1893, he returned to Australia, and was ministering for six years at East Maitland. At the end of 1900 Mr. Jackson arrived in Dunedin, to supply for the Rev. Dr Waddell. He was called to Timaru, and has been in his present charge since May, 1902. He stayed for six years. Reference: Cyclopedia of New Zealand, Canterbury edition. 1903 In 1901 there were 1,284 Presbyterians in Timaru and by 1911 3,011. Christ seated in Majesty designed by Kenneth Bunton and executed by Roy Miller (1915-1981) for the Miller Studios, Dunedin, 1963-64. Bunton an Englishman, sent designs out to Roy Miller. The design is based on Frederick Cole's Church of the Blessed Redeemer, Evansville, Indiana window. On the south wall of the porch at Chalmers. "Weird" said my other son to find a window like this in a church. "Was WOW based on this?" The Star of St. David is above a red cross and there is another cross above the orb. Christ is displayed as a human on a throne. "Enter into his courts with thanksgiving." The window is signed, a rebus, in the lower right corner MS DUNEDIN in a black diamond for the Miller Studios, Dunedin. 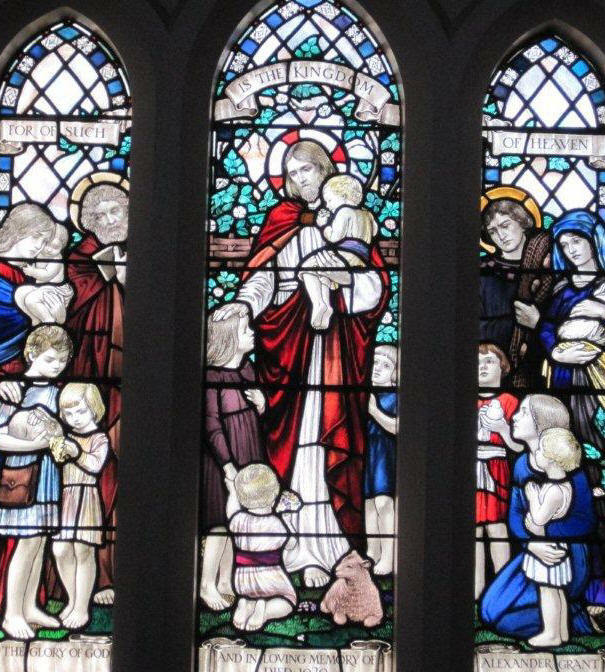 Christ and the children. To the Glory of God and in loving memory of Alexander Grant. Died 1920. 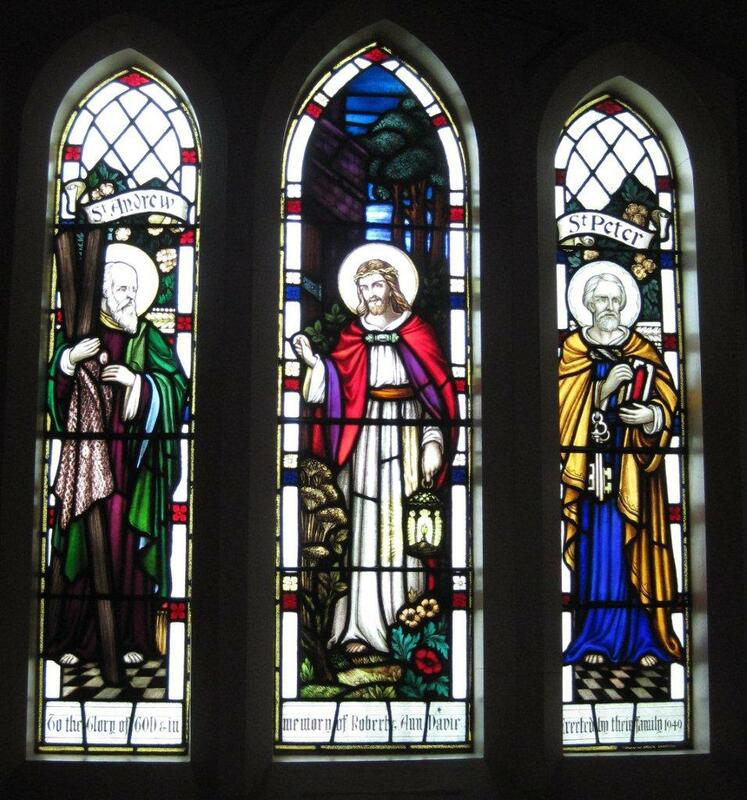 A three light window donated by Helen L. Grant the widow of Alexander Grant, late of Gray's Hills and Aigantighe, Timaru. 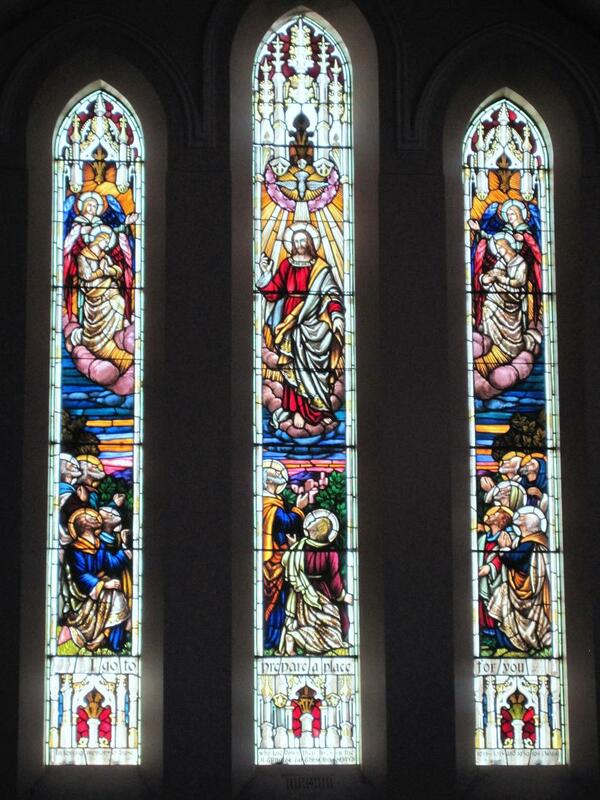 This was the first window in the church. Installed in 1924 and designed and executed by Arnold Robinson [former Joseph Bell & Son studio, Bristol, ENG. Robinson took over the firm in 1923] The window was arranged by Eva L. Robinson, an aunt of Arnold W. Robinson. Oswald Miller, a coach builder from Melbourne, established a small sign writing company in George Street, Dunedin in 1913. His sons, Ralph and Roy Winston Miller (1915-1981), joined the firm and in 1946 the partnership of O.G Miller and Sons was formed. Roy developed the stained glass studio from the contents including the kiln, designs and cartoons of Robert Fraser's studio at Rattray St., which his father had purchased. The business moved to Leith St. in 1953. The stain glass section operated at a loss or barely broke even. Roy and Miller Studios went on using the work of three main designers Frederick V. Ellis [1948-1961], Kenneth Bunton [1959-1969] and Beverley Shore-Bennett MBE [1970-1987]. Roy's son Winston Jeffery (Win) Miller (1942-2006) joined the company in 1958 and changed the direction of the company towards shop design, construction and fittings with innovation. In April of the same year the family partnership formed a private company and so Miller Studios Ltd was formed. 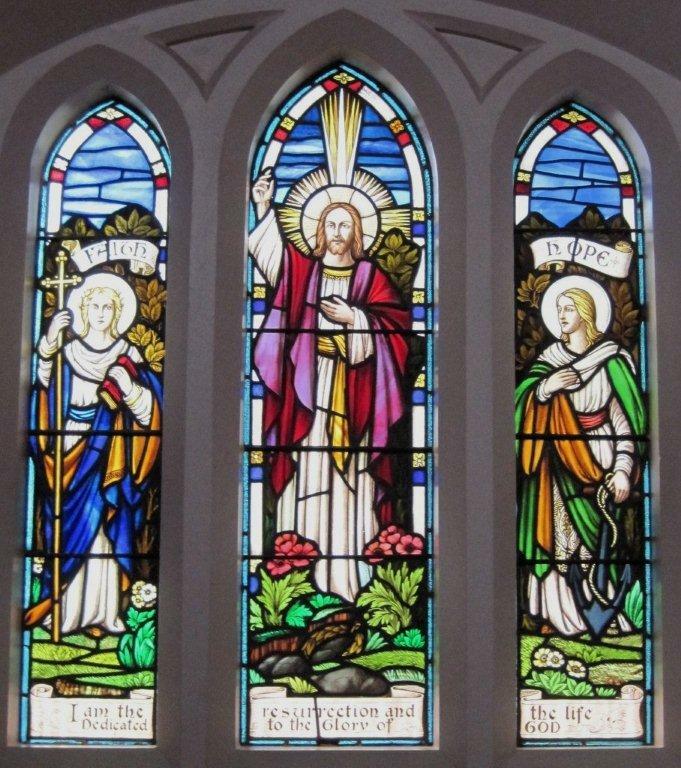 Stained glass work became an area Miller Studios excelled in for 35 years, producing work for churches and public buildings throughout New Zealand, including 48 windows in Canterbury. 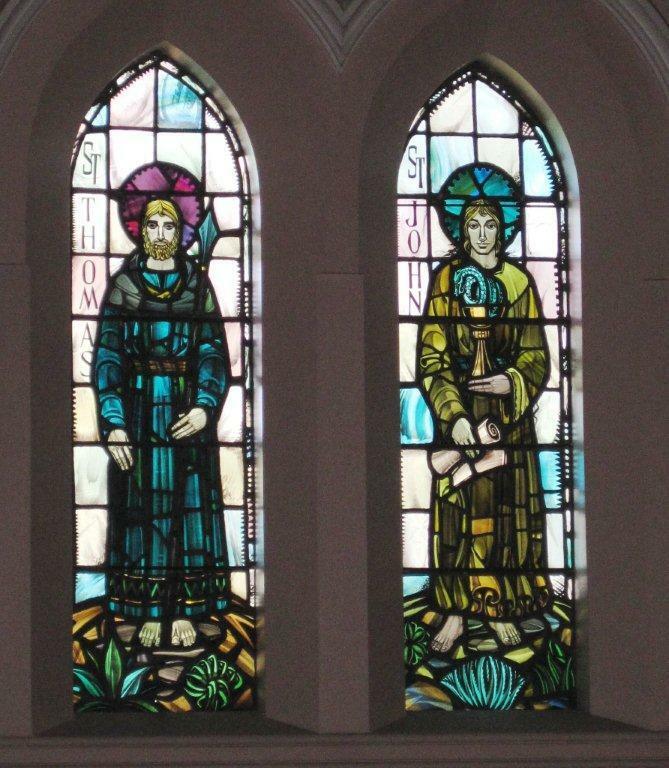 Roy was an elder in the Presbyterian Church and this probably helped him secure commissions there but not in the Anglican churches were church authorities felt stained glass must come from overseas studios. Sir Gawin and New Zealand servicemen at the TBHS library is Ellis's work. Burton who lived in 26 Mill Lane, Seven Oaks, Kent, England replaced Ellis in 1961 as Miller could not find a designer in NZ. Beverley Shore-Bennett, an artist, b. in Wellington in 1928, a student of F.V. 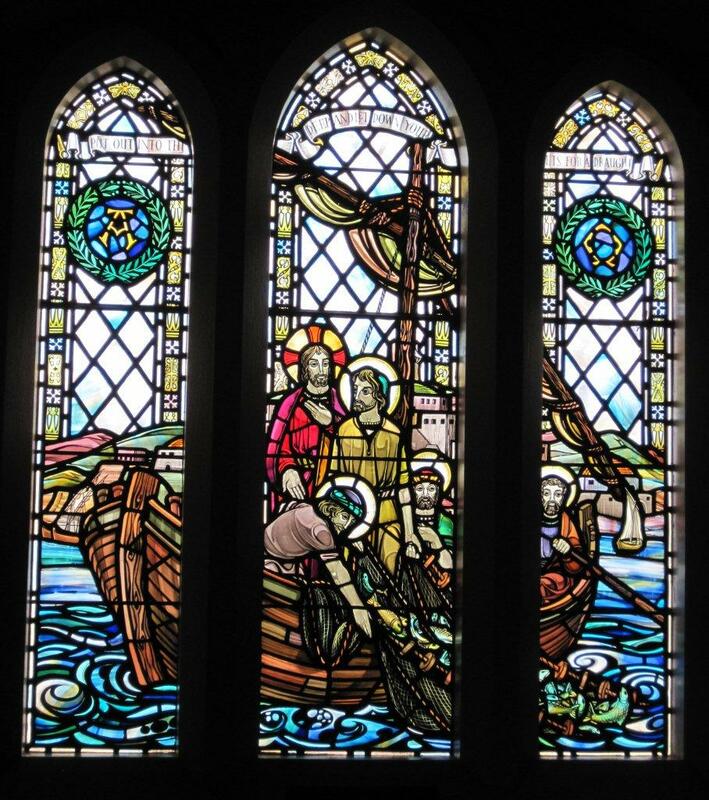 Ellis in Wellington was asked to design a window for the founder of the Holm Shipping company for the Wellington Cathedral and from this collaboration started working for Miller Studios from 1970 and soon replaced Bunton. She is the only New Zealand woman to be an elected Fellow of the British Society of Master Glass Painters. The stained glass section at Miller Studios closed in 1987. 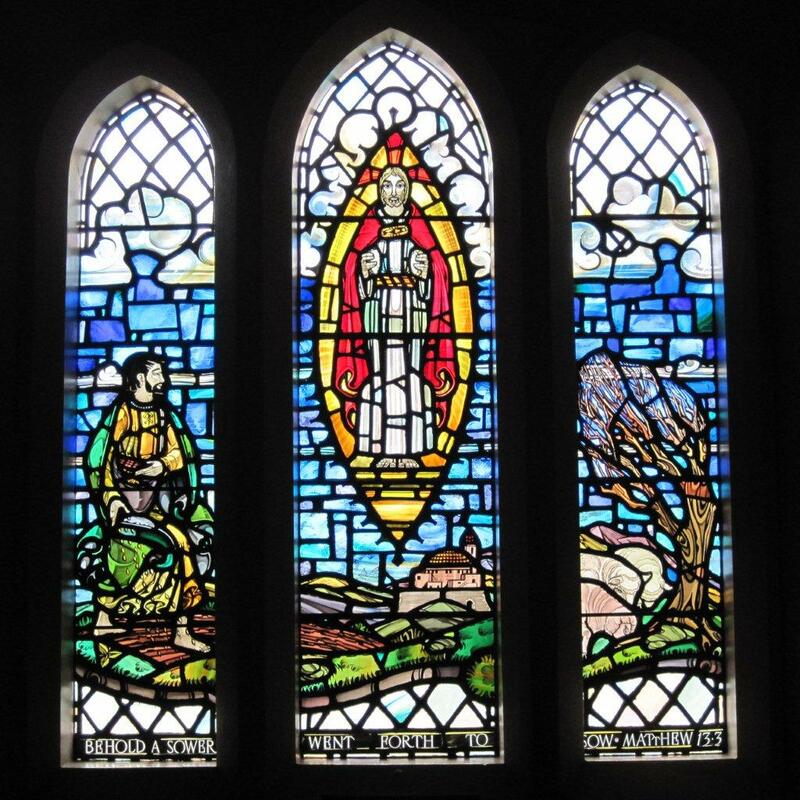 Reference: Ciaran Fiona, Stained Glass Windows of Canterbury, New Zealand, University of Otago Press 1998 and Miller Studios Ltd. The Sower / Christ the bread of life / Sheep. 3 lights -North nave, designed by Kenneth Bunton and executed by Roy Miller, 1965. To the Glory of God and in memory of William Stark & Jeanette Young, presented by their family, December 1965. Stained Glass - the beautiful art of coloured glass. The first duty of the artist is to decorate the building, the second duty is to decorate a window. A window is a hole in a wall, and it is not possible to think of the hole without thinking of the wall in which the hole occurs. Proportion - the artist is advised to maintain "a judicious proportion between the scale of his figures and that of the building, not the window". The artist will make every design suit its situation, the manner will be his own. But in the fifteenth century at all events English-made-glass was available. Medieval craftsmen had a singleness of purpose and intense love of his medium. In his own particular style he stands unchallenged. His colourings, though extraordinarily rich and striking are always skillfully coordinated. 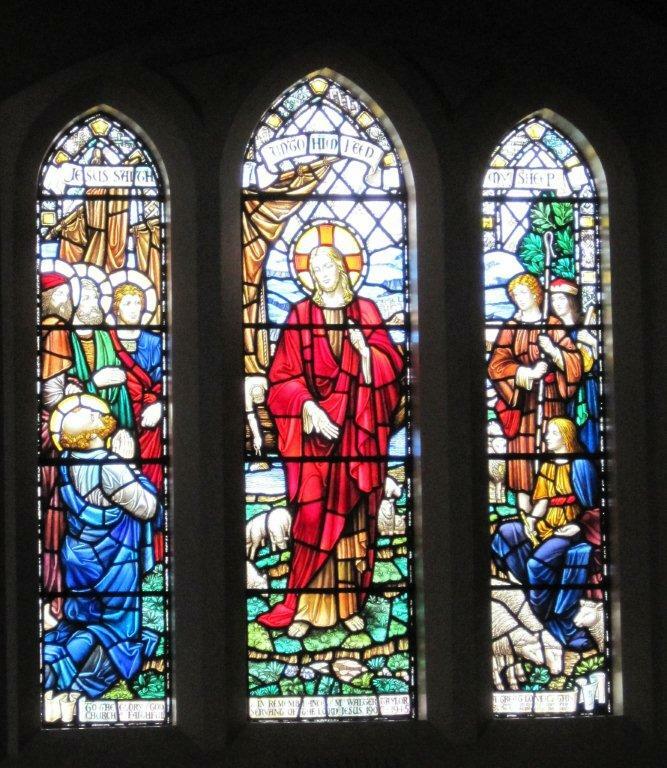 The motive of a stained glass window is primarily, decorative. Glass, unlike paint, is translucent and inflexible, its colours are coloured light, its shapes are glass shapes. 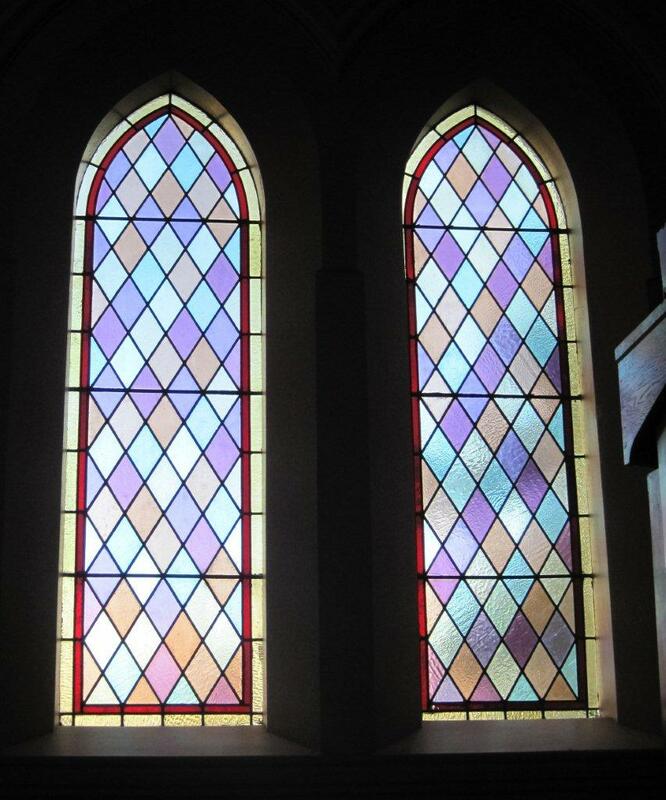 Stained glass windows should be to the edifice as jewels are to their setting, the one complementary to the other. That many windows are poor and lacking in the quality of jewelled splendor, is due to the poverty of the thin glass used, and to the excessive amount of surface paint used. We get pictures on glass instead of pictures with glass. Glass can be coloured by mixing metallic compounds when it is in a molten condition, pot glass. Or by painting the surface with coloured pigments and then fusing it slowly in a kiln, enamelled glass. Stained glass windows can be a substitute for paintings. Windows in the building to be enriched by the insertion in stained glass but sadly some are jarred by the contrast of some very poor new work. Years ago there were stained glass competitions for a design for a stained glass window e.g. having a northern light, with a semi circular arch and following the dimensions: length____. Open to artist of all nations. Each design accompanied by a scaled tender stating the cost at which the design can be executed, the time the execution is likely to take, and the name and address of the artist. The designs to which the prizes are awarded will become the property of the department, which however does not bind itself to execute either of them. Cash prizes for first and second. Monuments and stained glass has been neglected due to the ravages of time causing decaying stonework around some beautiful stained glass windows. Dirty windows have made churches very dark so there is a need for urgent cleaning. Other widows have been destroyed by fire and thunderstorm. 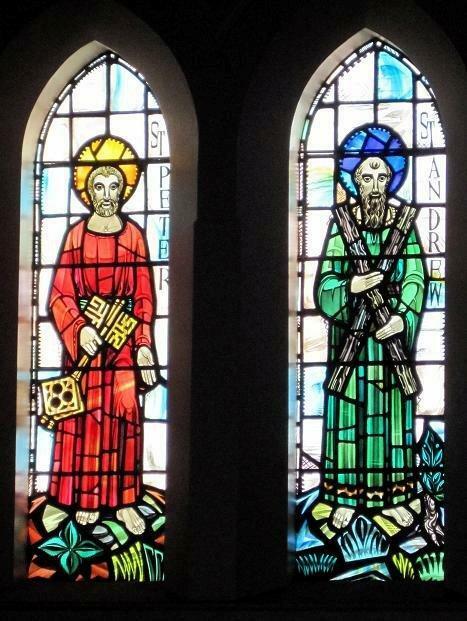 Beautiful stained glass windows can be shattered by intense heat. 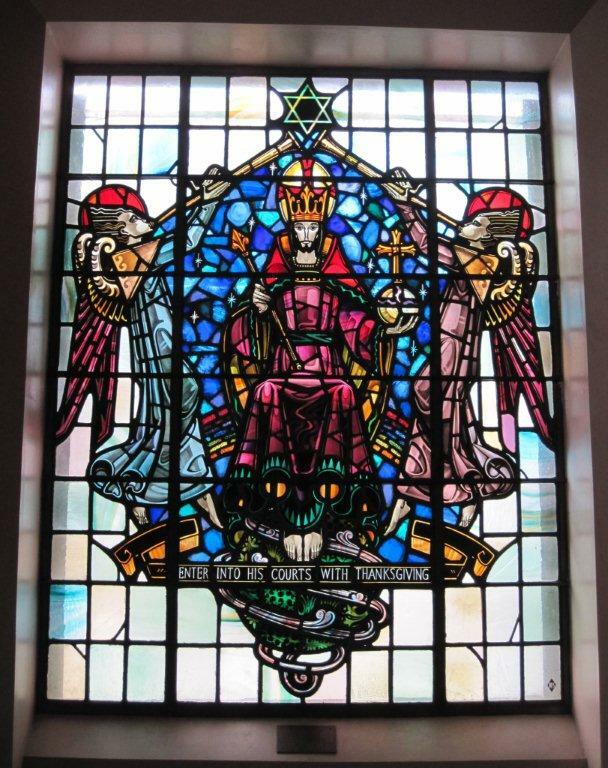 Thieves have been known to obtained entry into churches by breaking the stained glass windows while other steal fine old stained glass from museums. Expect to find Chalmers locked. Window 3. 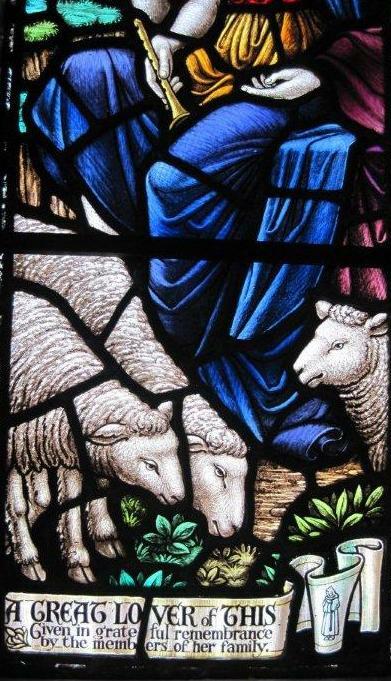 The three light beautiful 1951 Whitefriars window "Feed my sheep" at Chalmers Church, Timaru donated by the Taylor family. Taylor St., off King St. in Kensington, Timaru is named after the family. Look for the rebus, a tiny white friar, on the scroll, right lower corner. This was the signature for the studio of James Powell & Sons, Whitefriars, London from 1915 to about 1972 then the rebus was changed to a basic outline of a monk wearing a white cowl (a hooded garment worn by monk) until the company closed in 1980. After 1962 the company became known as Whitefriars. The Powell's glass works was built on the site of a former monastery. There are no marks on the early Powell windows. Stained glass windows contain some sort of casing (made of lead in the past) around the glass, pictorial windows are generally called Stained Glass and decorative geometric ones are Leadlight windows. A rebus is an old and quaint mode of expressing words or phrases by pictures of objects like the early sheep brands found in the Canterbury Brand Book. The sheep brands around the merino ram's head are: Acland & Tripp, MacDonald, Studholme, the diamond is R.H. Rhodes and G. Rhodes and far right is Butler. "Jesus Saith Unto Him Feed My Sheep" "To the glory of God. In remembrance of Mrs Walter Taylor faithful servant of the Lord Jesus 1877 - 1945." George Taylor's son, Walter Taylor, was b. Jan. 1 1870, Dunedin. In 1908 he and his family, wife Mary Downie Taylor, moved to Timaru and within a year he had purchased the wool scouring business of Morgan Evans & Co Ltd at Saltwater Creek. The name was changed to Walter Taylor & Co Ltd. Walter and Mary purchased a two-acre property in King St. in 1908 and it was eventually sold in 1946 after Mary's death. The house is now situated on Taylor Street. In 1951 a memorial window was unveiled in memory of Mary. Mary had been an active member of the church and the family had decided to donate the window to the church as a mark of respect. Rev. Peter Wishart retired to Dunedin in January 2009 after 14 years with the Chalmers Church congregation. He has been a reverend since 1969. He ministered in Invercargill for nearly five years and married his wife, Janet, there. In May 1992 the pair arrived at Chalmers Church. His father, a minister, had been here and his grandfather had been part of the parish. "The church used to be focused on getting people in on a Sunday. Now it's more focused on how the church can help in the community and developing the church as a centre for music as there are great acoustics in here." Photos taken by M.T., in mid August 2010 around 10am. There there will always be light variations around the church - north side and south side.